November 12, 2016 (Stroudsburg, PA) – ‘Tis the season to come together as a community and help those in need. The members of East Stroudsburg University PRSSA bundled up and set out to Dunkelberger’s Sports Outfitter on Main Street to ring the bells for the Salvation Army Red Kettle Campaign. The chapter raised a total of $60 for families in who need extra assistance this holiday. Within six years the campaign spread from coast to coast and now the kettle initiative has reached other countries. This yearly campaign has and will continue to help thousands in need throughout the holidays. 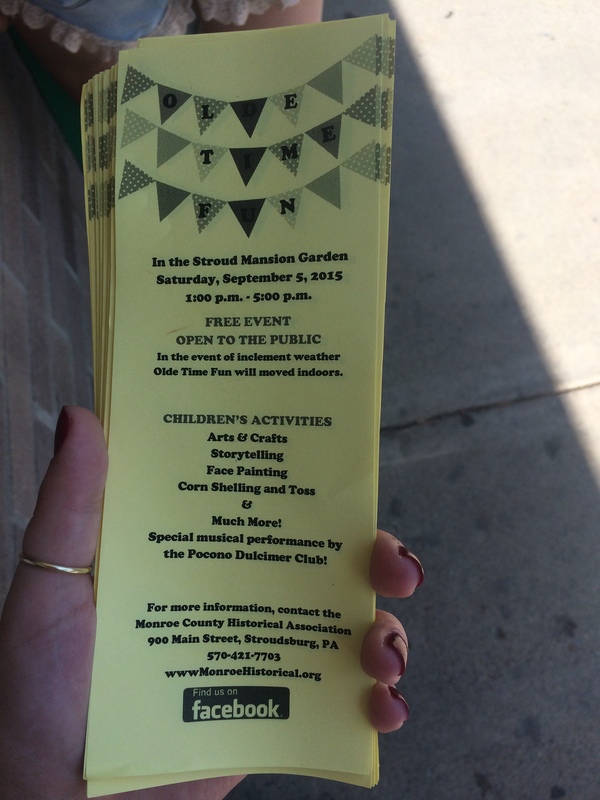 September 3, 2016 (Stroudsburg, PA) – The PRSSA chapter of East Stroudsburg University joined with the Stroud Mansion and the Monroe Historical Society to invite Stroud Fest attendees to participate in Olde Time Fun. Activities included arts & crafts, storytelling, face painting, and a live musical performance by the Pocono Dulcimer Club. Stroud Fest, hosted on September 3, annually allows for many local business and organizations to introduce themselves to the community. Stroud Mansion is located at the end of Main Street, away from the center of the downtown crowd, so many community members were previously unaware of the activities the Mansion had available. Chapter members passed out flyers and spoke to Stroud Fest goers about the Mansion and encouraged involvement in Olde Time Fun. Using their strong marketing and communication skills, PRSSA was able to assist in rallying a large crowd of adults and children at the Mansion. All organizations involved were thrilled by the success and enjoyed the opportunity to continue utilizing their community-bound relationship. 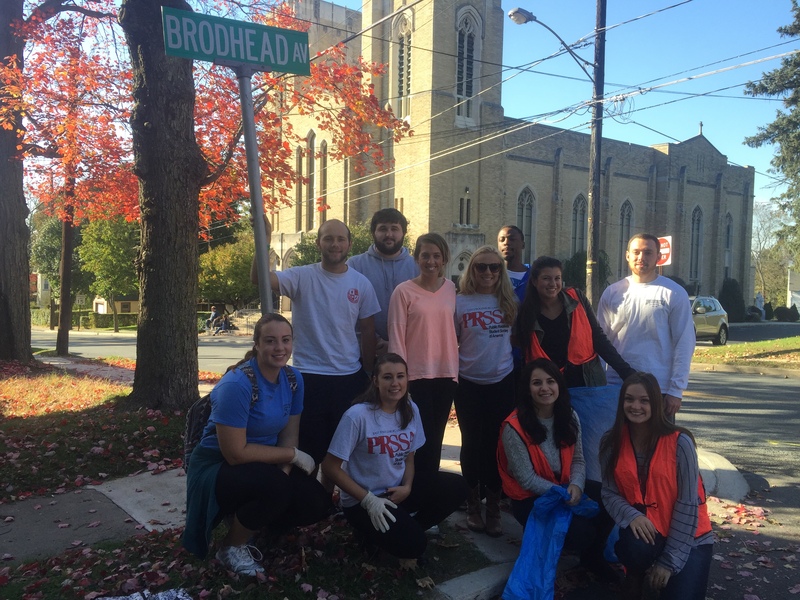 October 20th, 2015 PRSSA spend their time cleaning up Brodhead Ave. Every semester, PRSSA gets together to give back to the community by participating in Adopt-a-Block. We pick a street and spend time picking up trash to clean up the area. 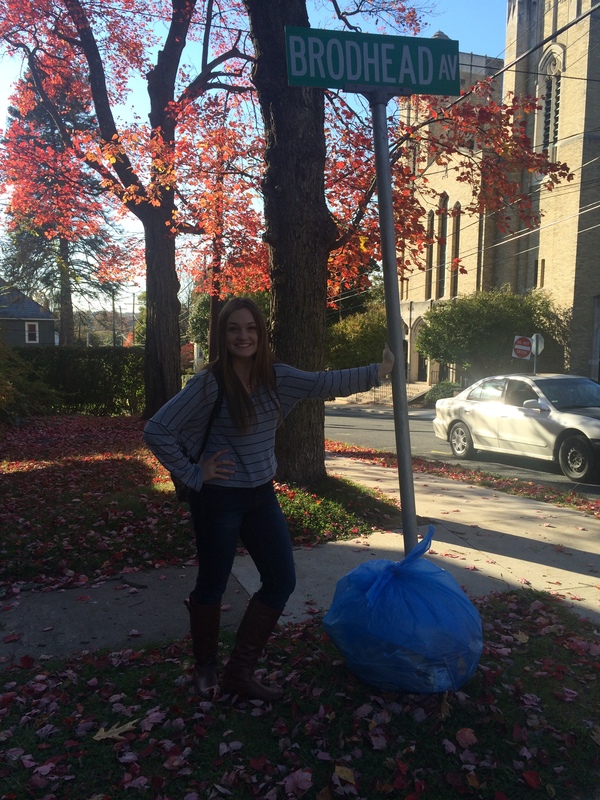 We love to pitch in and help out keeping our surrounding community clean and safe for all! 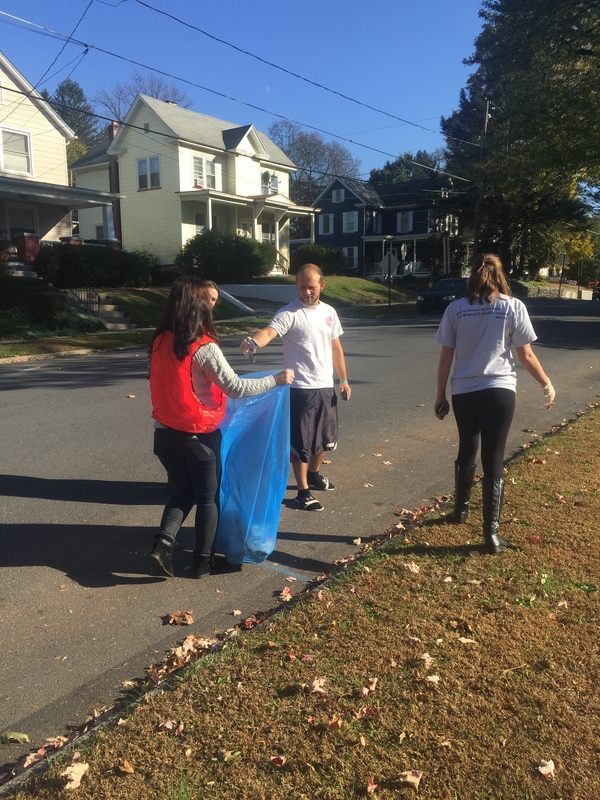 This year it was a beautiful day out and we were able to collect all the trash making Broadhead Ave Street looking spotless! PRSSA lends a hand in helping The Sherman Theater. 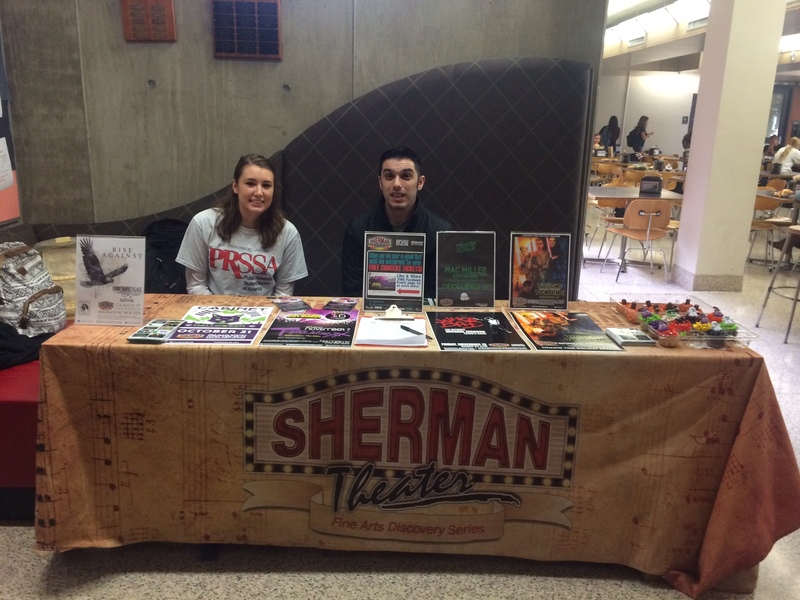 Tuesday October 20th, 2015 from 12:00 p.m. to 2:00 p.m, The Sherman Theater reached out to us in asking PRSSA help to promote their new upcoming concerts this year. We set up a table at the University Center, otherwise known as the Union, with an email signup sheet for ESU students to have a chance to win a pair of free tickets of their choice! We promoted through PRSSA’s social media to generate excitement and help get the word throughout campus. There was a great deal of people who came to sign up for the event and get more information about the different concerts being held at Sherman Theater. We will most defiantly be working again with them soon, stay tuned! 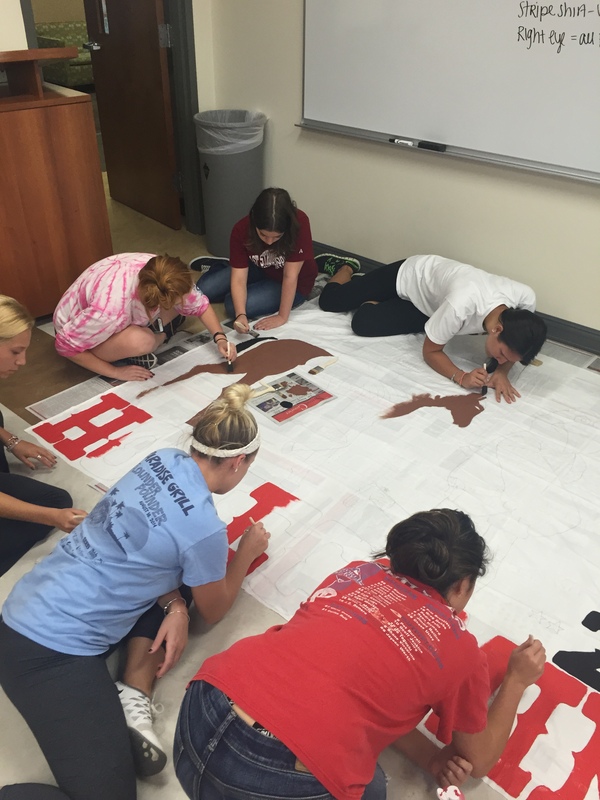 PRSSA Wins Homecoming Banner Competition. 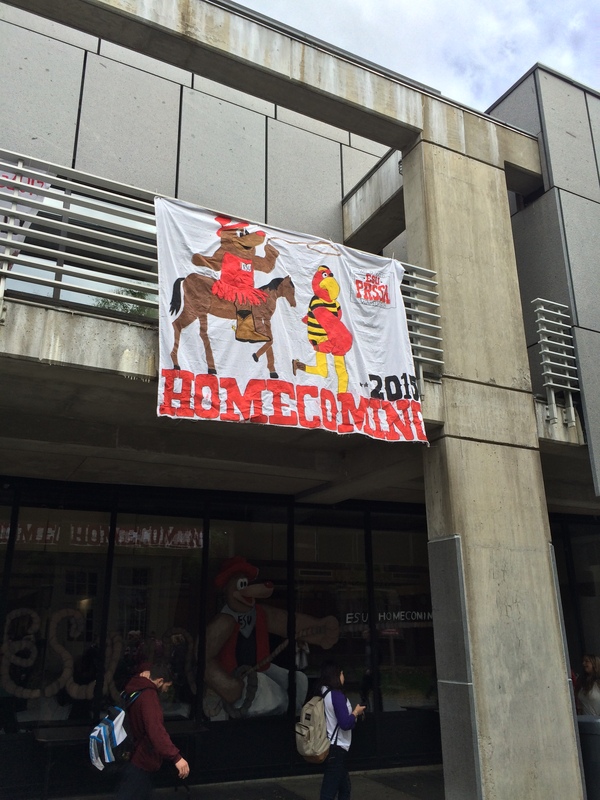 Saturday the 17th 2015, ESU’s homecoming banner winner was announced. PRSSA took the lead in the competition and won overall for best and most creative banner out of all that were submitted. For the past two weeks prior, PRSSA was vigorously working together to make a magnificent banner in the hope to win $100 credited to PRSSA’s funds. Last year’s competition we came in second place so this year we were determined to place first. Thanks to all of our club members who came to work on the banner. We can’t wait till next year and hopefully hold our title! 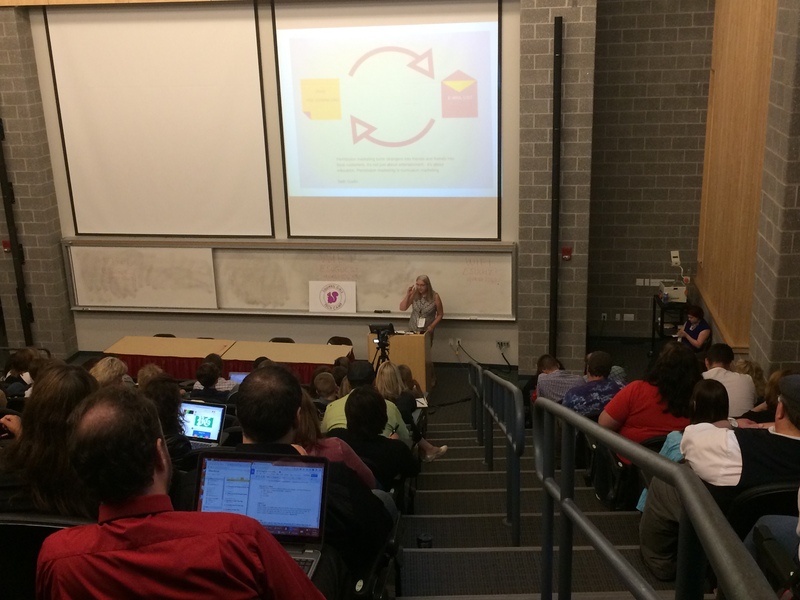 Saturday September 12, 2015 from 9:45 a.m. to 4 p.m., East Stroudsburg University ‘s (ESU) Hoeffner Science and Technology center held NEPA’s Blogging, Social Media Conference. Tickets were sold to the public who were interested in learning about bogging techniques as another communication tool. NEPA asked ESU’s PRSSA if they would help out in spreading the word about this year’s conference. We were given a handful of tickets to give out for free to students. All the proceeds made from the event went to Squirrel Girls Tech Camp, a stem Education Camp for girls in grades 4-6. We helped by advertising through PRSSA’s social media about the upcoming event. 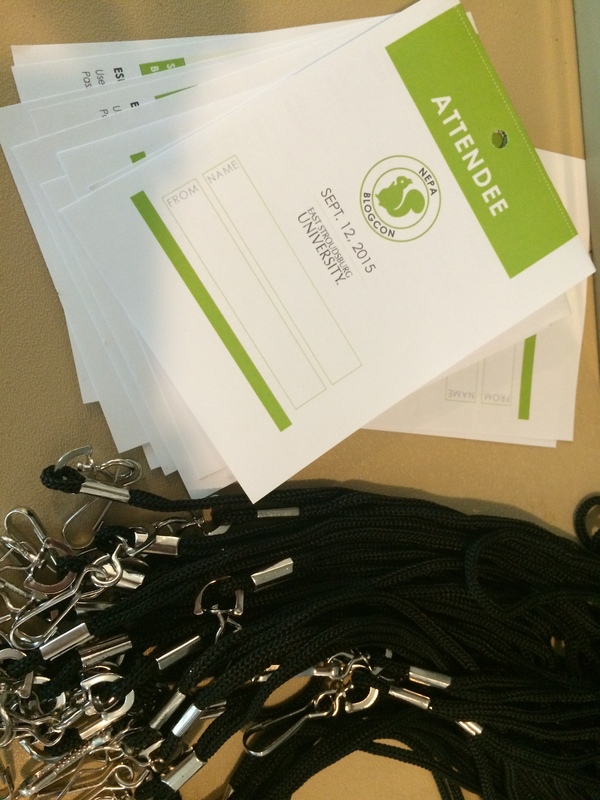 The conference was sold out, and filled with various people from the community. We lent a helping hand the day of the conference in setting up tables and giving out SAWG bags, which included different fun items for the attendees. There were various speakers that some of our club members were able to sit in on the conference to listen. Everyone had a wonderful time listening to the speakers, and we are hopeful they will come again! Saturday, September 5th 2015, The Stroud Mansion of the Monroe Historical Society held an event in their back lawn for all to enjoy. East Stroudsburg hosted the Bicentennial Festival on Main Street, and the Stroud Mansion participated in hosting an Old Time Fun day. The event included free face painting, storytelling, crafts, and more. 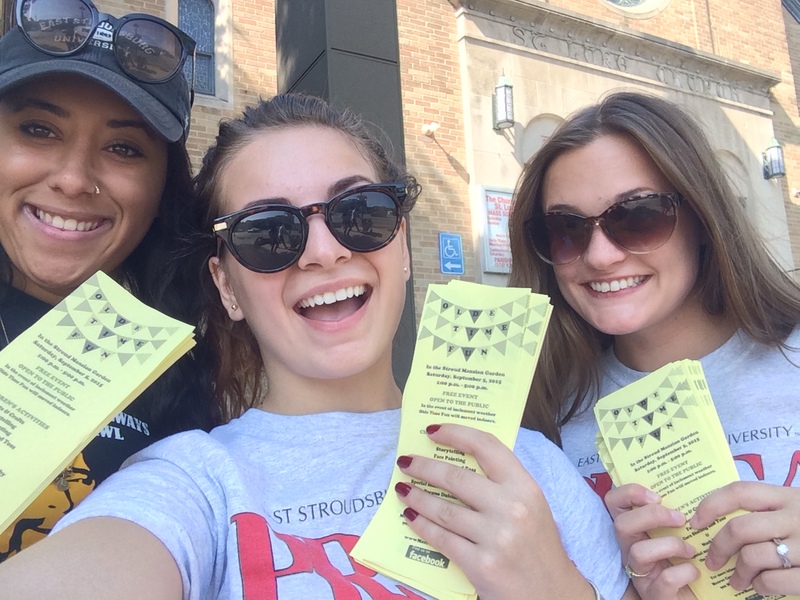 ESU’s PRSSA Club helped out by handing out flyers to all on Main Street that is a few blocks down from the Mansion. The festival ended on 8th street, the Mansion is located on the 900 block of Main. ESU PRSSA helped raise awareness to those that were farther down the block of the fun them and their children could be having at the Stroud Mansion! The faculty at the Stroud Mansion thanked us for the large turnout and said it was great to have us apart of their day. 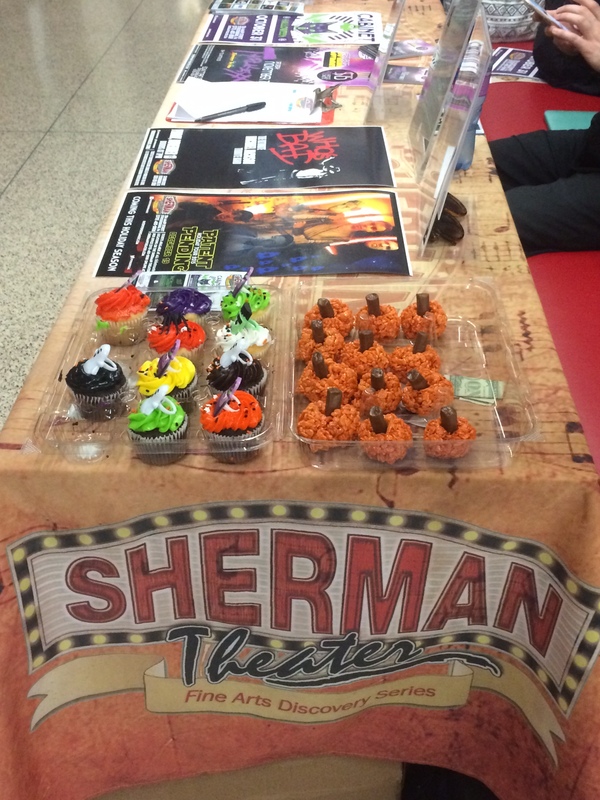 East Stroudsburg, PA, September 1ST, 2015- East Stroudsburg University’s Public Relations Student Society of America chapter participated in the fall club fair on Tuesday, September 1st. The club fair, which is hosted by Student Senate once a semester, allows students to be introduced to the many clubs that ESU has to offer. A variety of clubs and organizations gathered in the walkway of Stroud Hall and the University Center to present what they do in hopes to recruit more members. It was a very successful event for PRSSA. Many prospective members expressed their interest in joining and were able to interact with current members and executive board members to learn more about PRSSA. We had a huge turnout at the meeting that followed after the fair was over. About twenty-five students came to be a part and learn more about our society. 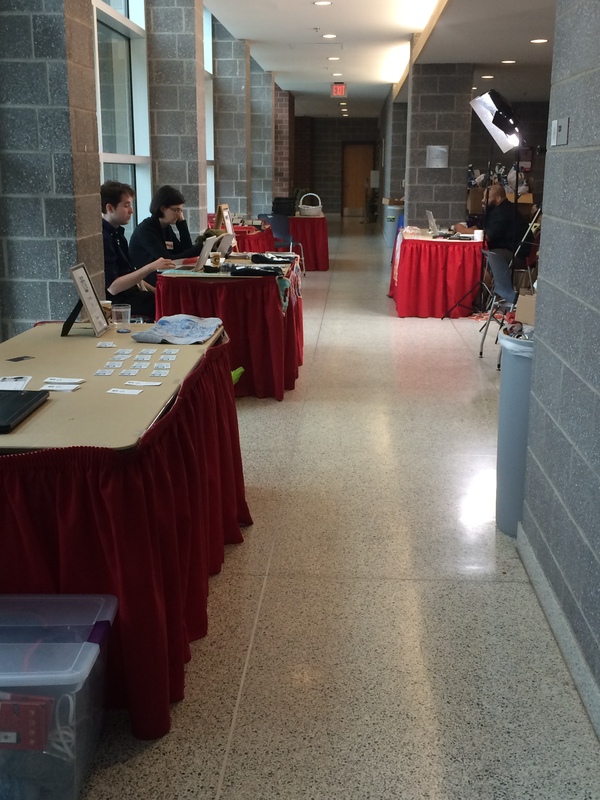 East Stroudsburg, Pennsylvania (February 23, 2015)-The Public Relations Student Society of America (PRSSA) East Stroudsburg University Chapter recently teamed up with the American Red Cross to help with the February blood drive. The blood drive took place on Monday, February 23, 2015 with a successful 62 donors who were able to give blood to a total of 186 that were in need. Members of PRSSA volunteered prior to the event to help recruit donors by posting flyers on campus, posting on social media pages, as well as have a recruiting table in the Union with PRSSA and Red Cross members. The day of the drive members of PRSSA helped volunteer their time to ensure the event ran smoothly by checking in donors, keeping them company, and handing out snacks those who donated. Members of PRSSA also made donors aware of and helped to register them for the next blood drive. East Stroudsburg, Pennsylvania [March 17, 2015]-Diane Hannan of Hannan Communications discussed with PRSSA what it is like to be in the public relations field. Hannan’s career began as Director of Public Relations for the Pocono Mountains Vacation Bureau. She helped the team develop attention-getting campaigns, and also developed a tool to help assess where inquiries were originated. From there, Hannan’s success only grew. She then began her own agency in 1978 to create her own entity. She has worked with clients such as Bushkill Falls, Pike County Public Library, and Buckhill Golf Course. The most important advice that Hanna gave students of PRSSA was when it comes to Public relations, “you need to believe in your product in order to sell it”. Hannan also discussed the topic of ethics in public relations and when it comes to in-house and outsource communications, you also need to believe in them, or “wish them the best of luck”. Diane Hannan is the first public relations agency in Monroe County. She serves on multiple local committees, and is an active part of her community. East Stroudsburg, PA, October 10, 2014 – Every year the Public Relations Student Society of America National Committee and Conference Committee hold a PRSSA National Conference in a city of their choice. This year, the city was Washington, D.C., the center of our country’s political system. At these conferences, PRSSA chapters from universities across the nation attend to network, discuss current day topics within the public relations field, and share award-winning research results. With professionals as hosts and deliverers of keynote speeches, the conference allows for an endless amount of opportunities to gain knowledge necessary to make for a formidable club and a successful you. This year Tina Hennessey, ESU’s PRSSA President, and Brendon Abbazio, ESU’s PRSSA Vice President were able to attend and represent their school at the conference. The conference had a pre-schedules itinerary with all kinds of speeches, workshops, events, and sessions to choose from. The conference was held from October 10 – October 14. Tina and Brendon were only able to stay from the 10th to the 12th, but they made the best of the short stay and gained priceless insight from speakers such as Vanessa French, President and Founder of Pivot Point Communications, and Pam Jenkins, President of Powell Tate. Networking in between the functions allowed for strong connections among PRSSA chapters and resulted in gathering helpful tips that other clubs use to run their student-ran firms as well as providing some of their own tips. Between the invaluable knowledge gained and the exploration of one of our country’s most monumental cities, the PRSSA 2014 National Conference turned out to be not only a vital career decision to partake in, but an experience to last a lifetime. NEW YORK, NEW YORK September 20, 2014. – East Stroudsburg University’s Public Relations Student Society of America chapter took part in PRSA New York’s 2014 Ethics Mock Tribunal on September 8. September is recognized by PRSA as ethics month, an opportunity for chapters to inform members through developed programs. The trial was designed to spark conversation about ethical conduct of practicing professionals and address criticism against public relations. Held at the SUNY Global Center in midtown, the sold out event provided an energetic debate by putting public relations on trial. The panel of participants included a variety of CEO’s, journalists, and ethics professionals. The event was an excellent experience for PRSSA members to interact with public relations professionals and learn about the important role of ethics in various companies and public relations work. This Saturday East Stroudsburg University’s Chapter of PRSSA will be “canning” at the East Stroudsburg Walmart to benefit the Monroe County United Way. Canning is an efficient way for clubs and organizations to gain money from the public and only requires a good attitude and a money jar. PRSSA member Avery Gardner organized this event. After obtaining a date and setting a schedule for members to stand outside Walmart, students will arrive at 9:00 AM to collect money. After creating signs and large money jars, the organization hopes to gain a lot of money for their philanthropy this weekend. The money from this canning drive will all go directly to the United Way of Monroe County. This fall the organization has pledged to donate money from their events back to the community. Later this year there will be more opportunities to support the United Way of Monroe County. Jenna Bush-Hager, daughter of former United States President, George W. Bush visited East Stroudsburg University on Tuesday. Currently a news anchor for the Today Show, Bush came to ESU to talk to students about her experiences as a humanitarian. Over the past few years, Bush has traveled to places such as Burma and Africa seeking to improve the women’s rights as well as literacy. She said Tuesday night “The more we know about the world, the more likely we are to help others.” After traveling to dozens of countries while her father was in office, Bush decided that it was her turn to seek out global harmony. She claims to be so grateful for being part of a country that opens multitudes of opportunities for its citizens and wants other countries to become more equal and more educated. After receiving her teaching degree and turning her third and fifth graders into “curious and eager” learners, Bush set out to Guatemala to teach children who have little to no education opportunities. She donated much time as well as money to the town she was teaching in to support not only education but to make sure that the babies and children of this area were not being malnourished. Through donations and sponsors, Bush was able to provide hundreds of packets of “sprinkles” to this community. These sprinkles were designed so that they could be sprinkled into a baby’s or child’s food and would provide them with the necessary vitamins and nutrients for them to build a healthy and strong body and immune stsyem. After Bush’s inspirational talk, she opened up the Keystone room full of ESU students for questions. Michelle Wilkes-Carilli is an Associate Professor at East Stroudsburg University as well as an alumnus. After working for the Pennsylvania Governor early in her career as well as completing her graduate studies in Illinois, she displayed excellent professional skills to PRSSA. Wilkes-Carilli gave a PowerPoint presentation incorporating question and answer sections to familiarize our club with preparing for the work force. Her main topics included resume building, preparation for an interview, interview attire, and what to do if the job is given to someone else. She stressed the importance of having questions to ask the interviewer as well as the importance of sending a thank you note after the interview. In the last element of this seminar Wilkes-Carilli talked about possible interview questions and gave out a sheet of commonly asked questions for students to take home. Christopher Kennedy Lawford, son of Peter Lawford and Patricia Kennedy arrived on East Stroudsburg University’s campus around four o’clock last Tuesday. The well-known author and actor came to the university to give a presentation about addiction and recovery. This presentation was about Lawford’s mishaps with drugs and alcohol as well as his daughter’s. The purpose was to inform students and faculty about the dangers of drugs and alcohol. Also he wanted to provide insight to those who have been directly or indirectly affected over the course of their lives.